1887 was not the best year for the San José-based Santa Clara Mill & Lumber Company. In this year their largest redwood logging operation was located far up Zayante Creek, approximately 5.4 miles from Felton Depot. Nearly half the route to the mill was via a precariously-built switchback line that largely follows modern-day Zayante Road from Waner Way to Mountain Charlie Gulch. Just to make matters more annoying for the firm, another 2 miles of cheaply-constructed, rickety track continued out from the mill to reach the timber tracts. Then, in the early summer of 1887, the entire mill burned to the ground. While this was not an unusual occurrence for a lumber mill, it came right when the lumber company was wrapping up operations along Zayante Creek. With few other options, the firm rebuilt their mill and continued to the end of the season, at which point they scrapped their mill and abandoned their short-lived railroad. This 4-mile-long route constituted the first Santa Clara Valley Mill & Lumber Company railroad, but it was not their most famous line. Another interesting development occurred in 1887 completely unrelated to the lumber company: the Southern Pacific took control of the South Pacific Coast Railroad, including its 7-mile narrow-gauged line that ran between Felton and Boulder Creek. This short route had been completed in early 1885 to replace the San Lorenzo Valley Flume & Transportation Company lumber flume that meandered up the valley to a point above Boulder Creek. Fortunately for the Santa Clara Valley Mill & Lumber Company, much of the timber tracts north of there were owned by them and remained relatively untouched due to the low efficiency of the flume and the readier access to timber from other sources. But in the autumn of 1887, the company shifted its focus to the upper San Lorenzo Valley and decided that the best way to get their lumber to market was with a railroad. Surveying and grading began soon after. 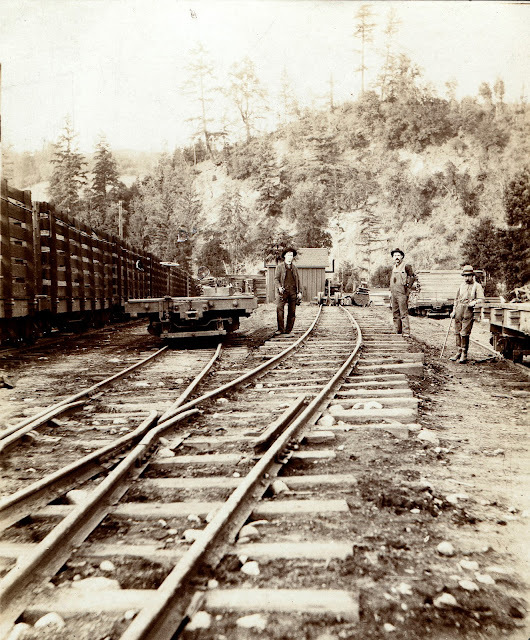 Popularly known by contemporaries as the Dougherty Extension Railroad, after company majority share-holders William and James Dougherty, this remote one-way, single-track, short-line railroad became a living entity in the Santa Cruz Mountains. Initially only built slightly beyond the new Dougherty lumber mill – modern-day Riverside Grove – roughly 3.5 miles north of Boulder Creek, it soon meandered north until it finally reached its ultimate terminus in 1900 at Tin Can Creek, 7.5 miles from Boulder Creek. In addition, it had sidings and spurs at the Cunningham Mill (Wildwood), Doughertys (Riverside Grove), Sinnot Switch, McGaffigan's Switch, and Waterman Switch, and a long private spur to the Chase Mill on Feeder Creek (additional spurs may have serviced the Harmon Mill, the McAbee Mill, and the Hihn-Hammond Mill on King Creek). This route was always first-and-foremost a freight line. By 1899, it had helped Boulder Creek become the fifth largest lumber exporter in the United States. And cost-cutting measures were found all around to maximize profits. North of the Cunningham Mill, the railroad cross-ties were small and generally made of subpar wood, the rails were second-hand, and the bridges were made of felled redwood trees. Between Boulder Creek and Cunninghams, the mill owners decided to use higher-quality material, partially because winter rains had a habit of washing out weaker bridges and partially because the route had become a popular tourist line in the summers. A camping trip to Wildwood, c. 1914. Note the truss bridge in the background over the San Lorenzo River. In 1902, the Santa Clara Valley Mill & Lumber Company closed shop and tore up its mill. Most of the other railroad patrons, except the Hihn-Hammond mill, had already abandoned their own spurs. But the line was not scrapped. Instead, a new conglomerate was founded in April 1903 under the name California Timber Company with the widows of the Dougherty brothers as major share-holders. Within a few months, virtually all of the smaller timber firms in the area were consolidated under this new umbrella company. The California Timber Company sought to harvest the headwaters of Pescadero Creek and they intended to once more put the railroad to use hauling that timber from Waterman Switch to Boulder Creek. Thus, for another decade, the railroad lived on as an intermediary even though all of its other customer base had left. It's name had changed to reflect its new ownership and was usually called either the Middleton Railroad, after investor Henry Middleton, or the Boulder Creek & Pescadero Railroad, after the long-held desire to connect the two titular cities. At the same time, housing subdivisions were parcelled out of the lands of the former Cunningham Mill, creating Wildwood #1 and #2 (across the river from each other). 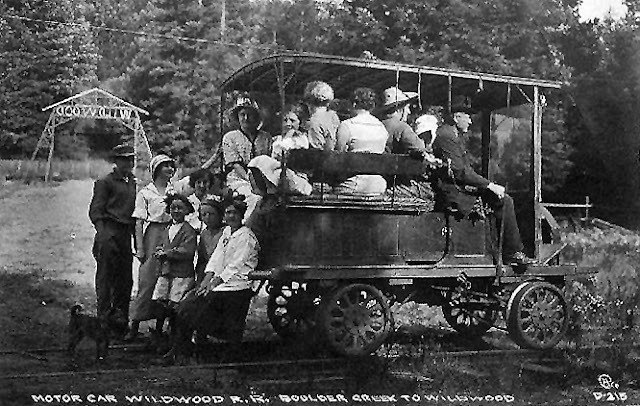 From 1909 to 1915, tourists and potential homeowners would ride a little electric car up to Wildwood. Then, suddenly, they stopped. 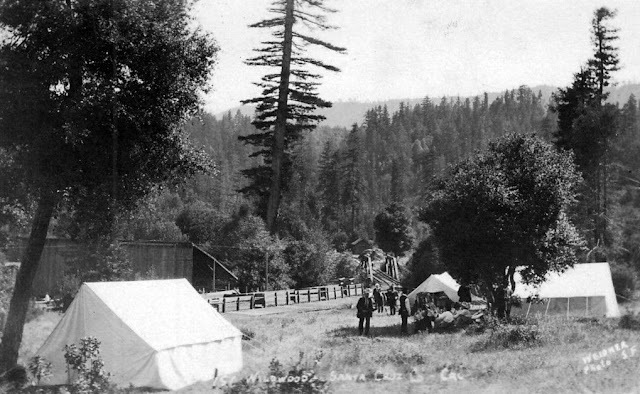 The logging at Waterman Gap had ceased in 1912 and maintenance of the remaining 2-mile route was becoming costly compared to the low returns for Wildwood property sales. The route was abandoned just like that. In 1917, the tracks were scrapped to be repurposed for use in World War I. The ties were left behind, where in many places they remain today, reminders of the legacy of logging in the Santa Cruz Mountains. 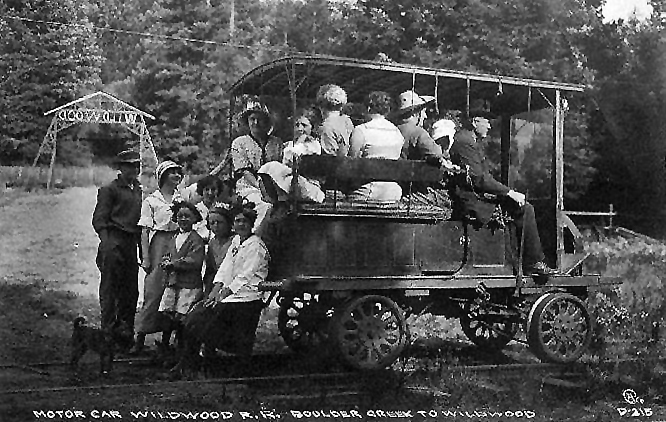 Passengers on the electric motor car at Wildwood, c. 1914. What is perhaps the most surprising feature of the Dougherty Extension Railroad, however, is not what it did, but what it almost did. In 1905, plans were apace to convert the 5-mile track to Sinnott Switch, as well as the 1-mile former right-of-way to the Chase Mill into a Southern Pacific mainline track to Pescadero via a long tunnel to the Pescadero Creek basin. Indeed, two major surveys were conducted by the railroad to complete this route. Only the 1906 San Francisco Earthquake shelved the project when Southern Pacific was forced to reallocate resources elsewhere and the company records regarding the proposed track were burned in the San Francisco fires (records of the proposed route mostly survive from newspaper articles). 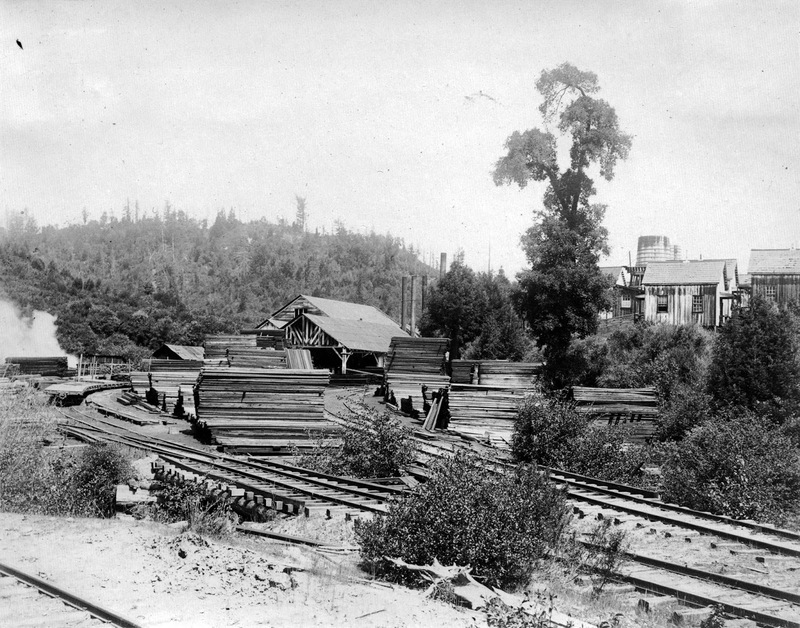 The year after the earthquake, however, new plans were announced to build two lines, with on going to Pescadero and the other to Saratoga via Congress Springs. A roughly 2.5-mile-long tunnel would be bored beneath modern-day Castle Rock State Park connecting the line to the track at Congress Springs in one of the most ambitious plans yet. Unsurprisingly, this route proved infeasible once the stock market crashed in 1907 and again in 1911. In 1916, plans were once again announced for a line to Pescadero since the Pescadero basin remained the only relatively untapped timber tract in the region, but World War I put a halt to any plans there. Meanwhile, in 1912, plans were apace to built a route up King's Creek (likely following a line already in place to service the Hihn-Hammond Mill on Logan Creek). This route would connect boulder Creek more directly with the Los Gatos Creek valley making the circuitous route through Felton and over the summit unnecessary. But this plan fell through as well. In the end, Southern Pacific Railroad never purchased any of the Dougherty Extension Railroad line and the line disappeared into history. A surprisingly large amount of this route still survives intact today, 120 years after it was first installed. From the first bridge over the San Lorenzo River north of Boulder Creek, the railroad right-of-way sits comfortably between State Route 9 and the river, where one may catch glimpses of it at times, although there are many homes now built atop the former track. At Wildwood (Pleasant Way) the route continues along River Road, eventually crossing Camp Campbell and Camp Harmon. From Teilh Drive, it once again sits between Highway 9 and the river until reaching Fern Drive. The route crosses the river at roughly the same spot where Fern Drive bridges the river, and the right-of-way continues north along the west bank from this point onward. At the Saratoga Toll Road, one can actually see the best traces of the right-of-way since many of the original ties remain in place. If one crosses Highway 9 on foot from across the entrance to the Saratoga Toll Road, they will find the right-of-way in a shallow cut. They can continue following this route for roughly 0.5 miles before encountering private property (all of this property is part of Castle Rock State Park). You may also follow the right-of-way to the north, although it becomes increasingly overgrown and difficult to navigate and there is an abundance of poison oak in the area. The route continues north, crossing the river at least five times, before ultimately ending at a large old stump near Tin Can Creek. Santa Cruz Evening News, 1908 – 1917. Santa Cruz Sentinel, Weekly Sentinel and Evening Sentinel, 1885 – 1917. Whaley, Derek. Santa Cruz Trains: Railroads of the Santa Cruz Mountains. Santa Cruz, 2015.